Last week I was invited by CHS Group to speak at one of their events on how to keep visitors flocking with great storytelling, using PR, SEO and social media. Having worked with events industry clients for a number of years now, I’ve noticed a shift in the kinds of tactics event organisers and marketers use to promote events and engage audiences. Many are shunning more traditional PR and offline promotion tactics in favour of social media. Of course, the best campaigns are cross-channel and fully integrated, incorporating both the online and offline channel experience. But digital marketing and social media is what I am most frequently asked about, so I wanted to share some simple tactics for online events promotion. The starting point for any good social campaign is setting out clear goals and objectives, and making sure everything you do is specifically targeted at your unique audiences. Taking time to set out personas and journeys for all your stakeholder groups will help you understand all the touch points for engagement along the way – and design your social campaigns and content around that. When we worked with CHS Group to develop their digital strategy, they saw a 20% increase in visitor pre-registrations for their flagship Conference and Hospitality Show event as a result. Digital campaigns offer enhanced hypertargeting on demographic and job role, as well as instant metrics and analysis data, which can be hard to achieve with offline marketing. There are now thousands of different social media sites, all with different benefits and features, and all targeting different niches. But if you don’t use social media regularly, it can be difficult to know which platform to use, and how best to use it, for events promotion. Instagram is a great platform for targeting younger audiences and for events with a strong visual focus. Content uploaded as an Instagram story is prioritised when a user logs in, so offers a great opportunity for immediate engagement. LinkedIn can be ideal if you’re targeting professionals for industry events, as you can search for potential delegates on job role, and message them individually for a more personalised approach. If you’re hosting an event, one of the first things that you should be doing is setting up an online events page to promote your event and make it easy for people to buy tickets online. If you don’t have integrated ticket sales functionality on your website, a platform like Eventbrite can do this for you. People want things to be easy for them, which is why this online ticket sales platform – with its quick and easy social sharing and email campaigns functionality – has risen to popularity so fast. You have the ability to set different ticket prices, so you can drive sales by adding ‘Early Bird’ discounts. This useful feature gives the sense of urgency, which can be vital in helping to secure early income and giving a more accurate estimate of attendee numbers. Another useful Eventbrite feature is its tracking functionality, allowing you to view statistics such as how many sales and page views your event has received. You can also see the individual details of each of your attendees including their email address, which you could then add to your email marketing mailing list to keep them updated with your future events. Don’t forget to make it easy for them to unsubscribe and include a sentence saying why they’re receiving the email, in order to comply with email marketing legislation. Whilst the platform is free to use if you’re hosting a free event, Eventbrite do take a cut if you charge for your tickets. Therefore, you could always try out one of the cheaper alternatives. As with any online promotion, reaching out to your network for help can make a huge difference. Make sure to stress how much of a difference their support will make, and provide a step-by-step guide of exactly how they can support you (i.e. sharing your posts, tweeting about your event, liking your posts and so on). The easier you make it for people to help you, the more willing they will be to help you. We tried this ourselves when we organised a fundraising event for our friends at the Children’s Heart Surgery Fund. The campaign we put together raised £3,197 for the charity in less than one week! On top of this, we gained a total of 42,638 social media impressions, 5,750 video views and we even managed to increase our Facebook page likes by over 15%. We recently increased social media engagement by 906% and website traffic by 4000% in just one month for one of our events industry clients. How did we do it? 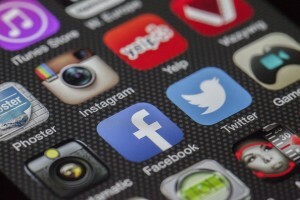 By focusing on Twitter and Facebook and implementing a proactive social engagement strategy. We targeted local influencers, events and businesses, and used Twitter to start and join in with local conversations. Take the time to research hashtags and Twitter hours around your industry and event, then compile them into a list. For example, if you were hosting a business event in Leeds, you could include #Business or #LeedsHour. You should also take the time to research industry thought leaders and influencers. Although it helps to consider how likely the account is to engage with you before adding them to the list. RiteTag can be a really powerful tool for hashtag research and Followerwonk for influencer research, but we have a whole list of great digital marketing tools for you to choose from! From here, you can put together a series of social media posts across Twitter, Facebook, LinkedIn and any other platforms that you may use. 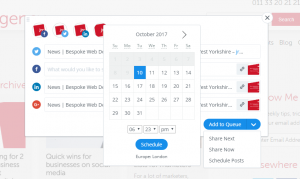 You can then use a social scheduling app such as Buffer or Hootsuite to schedule your posts ahead of time. With all forms of social media marketing, it’s important to bear in mind that you want to reach as many new audiences as possible, but that you also don’t want to overload these audiences with content. Facebook Ads research shows that if people see an advert more than three times, they start to turn off and block notifications. 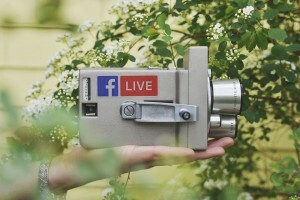 If you want to take this a step further, you could even ‘go live’ with your Facebook or Instagram business profile and do a more in-depth behind the scenes tour or a Q&A about the event. Most of the major social media platforms – Twitter, Facebook, Instagram etc. – have all introduced live-streaming features in the last few years. And with live videos receiving up to 10 times more comments than regular videos, it really is worth trying! We’ve used Facebook Live several times (most notably when Jonny dressed up as a clown!) and have noticed a huge spike in engagement when compared to our standard posts. Facebook Ads can work wonders for promoting events. The key feature with this is being able to customise a targeted audience, considering factors such as location, age and their interests. You can use other Facebook pages as variables too, although only if they have over 100,000 page likes. This can be useful if you have any high-profile competitors. If you’re hosting a local event, then selecting a more specific audience of relevant people within the local area can be effective. If you’re using Facebook Ads for the first time it’s important that you don’t go in blind, otherwise you may simply end up throwing money down the drain. We would advise either researching how to set up a Facebook Advert or working with a digital marketing agency to create the advert on your behalf. There’s so much that you can be doing with social media to promote your events. 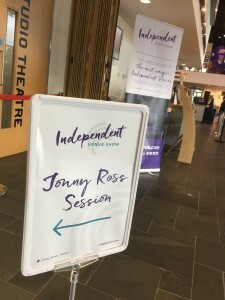 We have a whole load of social media and digital marketing tips on the jrc.agency blog that could be incorporated into your event promotion and general business marketing strategy. If you’d like some help getting your social media strategy right or running effective social media campaigns, why not get in touch with us to discuss your requirements? To get free digital marketing tips and advice delivered to your inbox, sign up to the jrc.agency blog.